Ghillean Prance (Professor Sir…) is a botanist with a long and distinguished career mainly revolving around the Amazon rainforest. He was one of the first people to highlight that it was bad to chop so much of the rainforest down and try to do a something about stopping the massacre. In his chapters in ‘God, the Big Bang…’, and Real Science Real Faith, Ghillean shows how holistic his approach was – he was thinking of the plants, the environment, and the people who lived in the rainforest, their beliefs and communities. He has certainly not been one to keep his roles in the Christian community and the scientific community separate. As tropical deforestation has accelerated I have become progressively more active in ecological issues, and as a consequence also in creation theology and the Christian basis for environmental protection. During my travels around Amazonian Brazil I have always looked for local churches and sought to link up with them and encourage their work in any way possible. I have seen excellent missionaries who have understood the needs and ways of local people. I have also seen mistakes. Back in the 1970s, I ran workshops and in 1993 I published a book called ‘Missionary Earthkeeping‘ to encourage people to learn the whole of what the Bible teaches about caring for God’s creation – care for the environment and care for individual tribes. Nowadays the approach is better, but that’s the message the West still needs to hear. I was partularly intrigued by Ghillean’s description in Real Science Real Faith of ethnobotanists who spend a lot of their time with indigenous people. The temptation to embrace the animist beliefs that give such a deep sense of value for the environment is often strong. Ghillean had already experienced Jesus working in his life through the Holy Spirit, so his reaction was to learn selectively rather than embrace the whole package. 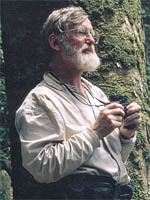 So he started by using tree climbers rather than felling trees to collect specimens, and spent the rest of his career doing what he could to protect the rainforest. Ghillean also did what he could bring what he had learned to the rest of the church, and he is spending much of his retirement (if scientists ever retire…) helping the church to rediscover its earthkeeping roots. Interesting letter in Science this week (24 Feb 2012) about church-led stewardship in preserving Ethiopian forests. (Will need a university network to access).